I have been fortunate to visit Glacier Bay National Park on two previous occasions, and I consider it to be a very special place. When Tim and I decided to spend the summer in Alaska, Glacier Bay was near the top of my list of places to visit. I wanted to return, and I wanted Tim to experience it with me. Getting to Glacier Bay, however, can be a bit of a challenge unless you are on a cruise ship. And even then, very few ships are able to snare the necessary permits, since only two large ships can enter Glacier Bay each day. You can take the ferry from Juneau to Gustavus, the gateway to Glacier Bay, but there are only two departures each week in the middle of the summer, and the only campground is for tents only. RV travel to Gustavus is strongly discouraged, although it seems to us that there might be some options for boondocking. Flying is probably the best option, and that is what we decided to do. Because we did not want to leave Kitty overnight in the RV by herself in Juneau, we had to make our trip to Glacier Bay a day trip. A very long day trip. The day started with a 5:30 am flight from Juneau on Wings of Alaska in an eight-passenger plane. We were in the air for less than a half hour, but we had beautiful views of the Lynn Canal and snow-capped mountains. Glacier Bay Lodge offers an eight-hour tour of Glacier Bay on a high-speed catamaran. This is the only scheduled day tour permitted inside the park, and we boarded the Baranof Wind at 7:30 am on one of the most perfect days to visit Glacier Bay. Many people view the park through the fog and mist, but we had a perfectly clear and sunny day. Our amazing luck continued. Glacier Bay National Park is the National Park System’s largest protected marine area and is a part of the largest World Heritage Site. It is a constantly evolving area. Just 250 years ago, there was no bay in Glacier Bay. The area was covered entirely by a glacier that was 100 miles long. Today, that glacier has disappeared, but there are still seven smaller tidewater glaciers that inspire awe in everyone who has the good fortune to see them. A National Park Service ranger accompanies every boat, including every cruise ship, that enters Glacier Bay. The ranger who sailed with us was an incredibly knowledgeable naturalist, and he provided insightful commentary about the history of Glacier Bay, as well as wildlife and glaciation. We especially enjoyed talking with him, and he kept our attention all day. I have always found presentations by National Park Service rangers to be among the very best out there, and this one was no exception. As the boat made its way into Glacier Bay, we passed very close to several islands where we watched Steller sea lions and harbor seals laze away the day on the rocks. We had plenty of time to spot tufted puffins and sea otters floating on the bay, and eagles and other numerous species of birds flying above us. We hugged the coast for a bit and observed a dozen or more mountain goats as they climbed along the steep cliffs. 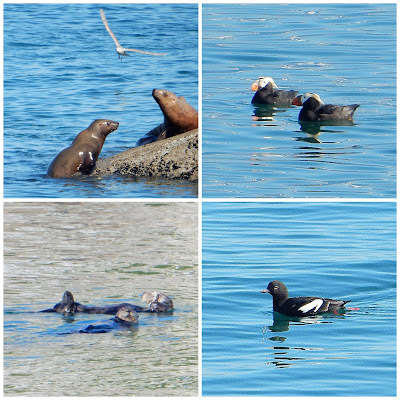 I especially loved trying to spot the mountain goats, puffins and sea otters. I can’t decide which of the three I think is the cutest. Lazy Bums - What a Life! When one thinks of John Muir, one typically thinks of Yosemite National Park. Did you know that Muir traveled to what is now Glacier Bay National Park to help prove his theory that Yosemite had been carved by glaciers, not by the Biblical flood? He visited the park on three separate occasions and made extensive observations of glaciers. We visited the spot where Muir was halted by the glacier in 1879. Today, that glacier has retreated an additional 65 miles, and that is how far we traveled. The end of the line in Glacier Bay National Park is Grand Pacific Glacier, which is located almost at the Canadian border. Grand Pacific is a stagnant glacier and not so attractive to look at. Next to it, however, is the gorgeous Marjerie Glacier, and we spent at least 30 minutes staring at this enormous wall of blue ice. We were close enough to pick out the intricate shapes and crevices, and anxiously waited for pieces of ice to fall off, or calve. The glacier is not just a visual delight. The sound of the calving is thunderous. It was hard to tear ourselves away. But, there was a special treat in store for us after we turned away from Margerie Glacier. Few people who travel in Glacier Bay are able to see Johns Hopkins Glacier. It is regarded by many as the most beautiful glacier in the park, but it is often shrouded in fog and is a bit out of the way for most boats. Because the day was so gorgeous, the captain decided to venture into the Johns Hopkins Inlet and treat us to a view of a glacier that is actually advancing and thickening. Although we couldn’t get very close because much of the inlet is a critical seal habitat, we still had a grand view. We also passed by Lamplugh Glacier, which Tim actually decided was his favorite. I’m not sure I can pick mine. I loved them all. Although it was a very long day, I loved every minute of it (well, maybe not all of the racket from some of the children on board), and I would highly recommend this boat tour to anyone. It would be nice if you had time to spend the night at the lodge, or one of the inns in Gustavus, but we were fine with flying back to Juneau late in the afternoon. The light was even better on the return flight, and we were treated to a view of Mendenhall Glacier and its lake from the air. That was a fitting end to a day in Glacier Bay National Park. At the beginning of this post I said that Glacier Bay National Park is a special place, and I still consider it to be so. It’s not only because of the presence of magnificent glaciers or plentiful wildlife. You can still see those things at other places in Alaska and elsewhere. What makes Glacier Bay so special is that it is a wilderness area that the National Park Service zealously tries to protect. In order to keep the wilderness experience as pure as possible, the number of boats that may enter the park is highly restricted. For most of the day, we saw not one other boat on the water. It was as though we had this magnificent place all to ourselves. It may be costly to visit this park, but it was worth every penny. You are so right about the huge crowds in so many national parks. It's sad that people are loving many of them to death. We often feel like we've hit the jackpot when we can enjoy a park with few other visitors around. Just as you seem to do, we try to visit the most popular ones in the off or shoulder season. I'm glad that you have also been able to enjoy some amazing glaciers. Hiking toward them must have given you such a different perspective. I think I would have felt very small in the face of such massive rivers of ice. One of my favorite places ... even though I only got to visit it once on a cruise ship in 2001. Had a gorgeous blue-sky day for our afternoon in view of Marjerie and Grand Pacific; didn't make it to JH ... too much ice, but did get in far enough to see Lamplaugh. That visit to AK was when I was bitten by the ice virus ... have since been to the polar regions of the world to watch and walk on glaciers ... they never fail to amaze me. I can understand how visiting Glacier Bay could affect you that way. How wonderful that you have been able to visit so many glaciers around the world. I love the water and boats in general. Throw in glaciers and wildlife? A once in a lifetime experience. So far, I have only seen Glacier Bay on a cruise ship. We have decided on a return trip to Alaska one day, by ferry, and now I can show Mike what we would miss if we didn't include Glacier Bay. Your pictures and description are wonderful! You are so kind. Glacier Bay really is an amazing place. That's exciting that you have decided to return to Alaska by ferry. I think Mike would thank you for including Glacier Bay on the itinerary!